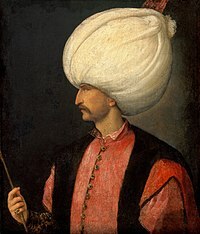 Suleiman I (سليمان Sulaymān, Süleyman; almost always Kanuni Sultan Süleyman in Turkish) (November 6, 1494 – September 5/6, 1566), was the tenth Sultan of the Ottoman Empire. He became sultan when he was 26 years old. He reigned for 46 years, from 1520 to 1566, which was longer than any other Ottoman sultan. He is known in the West as Suleiman the Magnificent and in the Islamic world, as the Lawgiver (in Turkish Kanuni; Arabic: القانونى, al‐Qānūnī), because he reconstructed the Ottoman legal system. He also led many wars in Europe, including wars in Hungary, the Mediterranean, and parts of North Africa. "1548-49". The Encyclopedia of World History. 2001. http://www.bartleby.com/67/794.html. Retrieved 2007-04-18. "1553-55". The Encyclopedia of World History. 2001. http://www.bartleby.com/67/795.html. Retrieved 2007-04-18. "A 400 Year Old Love Poem". Women in World History Curriculum Showcase. http://www.womeninworldhistory.com/sample-10.html. Retrieved 2007-04-18. Embree, Mark (2004). "Suleiman The Magnificent". http://www.ccds.charlotte.nc.us/History/MidEast/04/embree/embree.htm. Retrieved 2007-04-18. Halman, Talat (1988). "Suleyman the Magnificent Poet". Archived from the original on 2006-03-09. http://web.archive.org/web/20060309091926/http://www.byegm.gov.tr/yayinlarimiz/NEWSPOT/1999/JulyAug/N6.htm. Retrieved 2007-04-18. "The History of Malta". 2007. http://www.malta.com/about-malta/history-of-malta.html. Retrieved 2007-04-27. Hope, Maggie. "Suleiman The Magnificent". http://www.ccds.charlotte.nc.us/History/MidEast/save/hope/hope.html. Retrieved 2007-04-18. "Muhibbî (Kanunî Sultan Süleyman)" (in Turkish). Türkçe Bilgi—Kim kimdir?. http://www.turkcebilgi.net/kim-kimdir/m/muhibbi-kanuni-sultan-suleyman-31612.html. Retrieved 2008-01-13. Russell, John (2007-01-26). "The Age of Sultan Suleyman". New York Times. http://query.nytimes.com/gst/fullpage.html?res=9B0DE7D6163EF935A15752C0A961948260. Retrieved 2007-08-09. This page was last changed on 23 October 2013, at 12:48.